The New Year sees Volkswagen systematically forging ahead with its electric offensive and the transformation of the factories in Zwickau, Dresden, Emden and Hanover to become production locations for electric vehicles. The Zwickau facility is the trailblazer for this transformation, with the compact ID.1 already going into production there at the end of this year. By then, Volkswagen will have qualified thousands of employees to perform their future tasks. Along with further fundamental organizational and structural changes, this is an enormous endeavor for the company and the workforce. 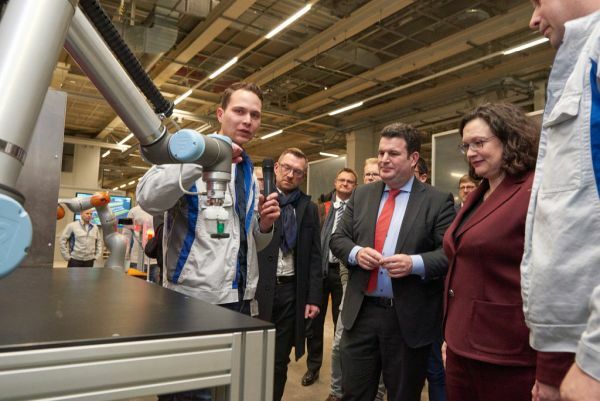 Today, Federal Minister of Labour, Hubertus Heil, and SPD parliamentary group leader, Andrea Nahles, will be joined by Volkswagen Board Member for Human Resources, Gunnar Kilian, and the Chairman of Volkswagen’s General and Group Works Council, Bernd Osterloh, on a fact-finding visit to the Zwickau plant to gain a first-hand impression of the progress and challenges of this transformation. The Chairman of Volkswagen’s General and Group Works Council, Bernd Osterloh, is also backing cooperation between policy makers and the company for successful structural change: “Time and again we have made it clear that the road to e-mobility urgently needs the support of policy makers. By that we mean very concrete initiatives that are not just theory, but actually function in real working life.